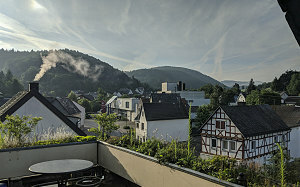 A peaceful morning dawned over the rooftops of Adenau, Germany. All was quiet until about 8am, when the wail of engines echoed off the hills near us. 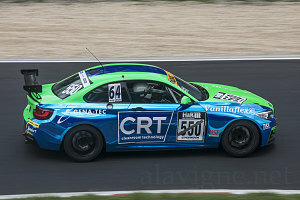 The Nordschleife was active again! That activity was not for us, though. 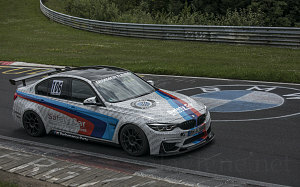 During weekdays, the daytime hours are almost always reserved for private events - sometimes by racing clubs, and sometimes by manufacturers, testing the performance of new vehicles. 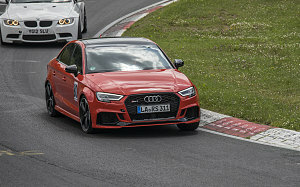 We definitely hadn't gotten our fill of driving on the Nordschleife - no way. 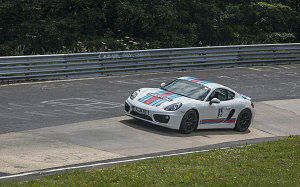 But, we were not part of this private track event, and we'd have to wait until the evening's Touristenfahrten session. So, what were we to do? 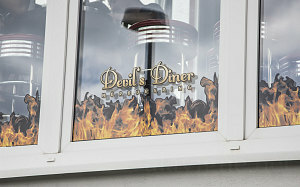 I had planned for this well in advance of our arrival. I postulated to Luke that we spend the morning and afternoon on rented mountain bikes. 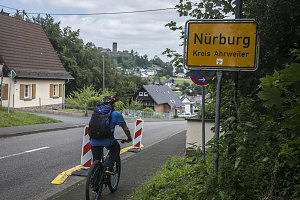 There was a decent network of biking trails that ran roughly around the entire Nordschleife, and that might be an excellent way to tour, learn, and see. And it would also be a good way to get a nice day of exercising in. The bike rental place (Radsport Breuer), which was conveniently located maybe 300 metres from our AirBnB and 200 metres from the track, wasn't open until 10 a.m. We took a stroll up to the road, to just past where Adenau's main drag runs through an underpass beneath the Nordschleife circuit. 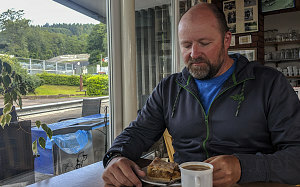 We proceed to have a nice morning coffee and apple strudel within sight of the Ex-mühe turn. After that we climbed up to a nearby viewing area, watching a couple of the day's private session drivers come round. Mostly they seemed to be driving high-end Porsches. 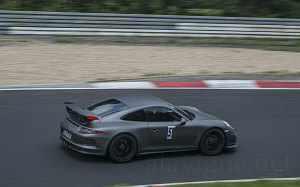 GT3s, that sort of thing. Picking up our bikes at 10 a.m., we consulted our detailed trail map and set off. 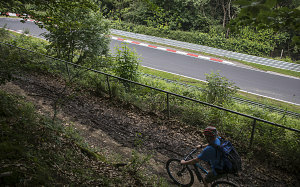 There is in fact a "definitive" mountain biking route around the whole circuit, but parts of it seemed to be routed rather far away from the track. So we'd improvise... using the definitive route where it suited us, and making litle custom alterations to keep us as close to the circuit as possible. 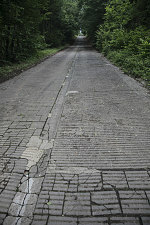 It was kind of a sleuthy scouting mission, to see all parts of the track up close. We were keen to see as much as we could before our next lapping session in the evening. 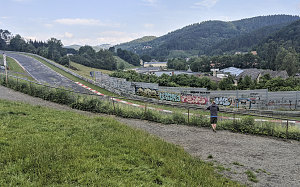 We left the main drag of Adenau and followed incomplete signage up towards the Wehrseifen turn, where we managed to find a culvert allowing us to cross under the track, to the inside of the circuit. From here we turned right, hoping to follow the inside edge as much as possible. And follow it we did, on a steep and rough track right up along the edge of the Kallenhard turn complex. Which runs downhill.... but much more downhill than we had understood while driving, because as we cycled uphill next to it (we were cycling reverse to the direction of the track), we realized that the grade was steep... heart-poundingly steep. And long! 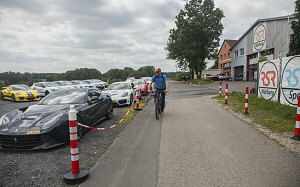 At the start of Kallenhard, the ground levelled out, and it was easy cycling to and past the Metzgesfeld turn complex (which I find a bit scary to enter, but which has an easy and fun exit). 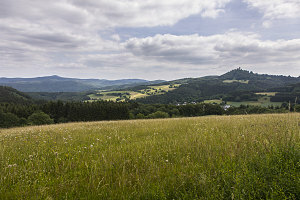 From here we followed a path through a beautiful field that opened into the vast countryside within the bounds of the circuit, with views all the way over to Nürburg castle, sitting on its high point. After the airy cycle across the open field, the path we were on plunged into dark and shady forest, and descended extremely steeply down into a sharp gully - steep enough to require a bit of technical mountain biking skills. 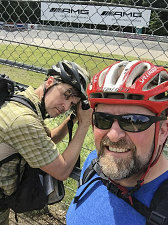 We could hear the roar of cars on the track through the dense foliage, but couldn't see it, so we got off our bikes and followed a faint footpath to the fencing and a marshall stop. We realized the gully was the lowpoint of the Fuchsröhre, or Foxhole. The Foxhole is a super high-speed steep down-and-up followed immediately by a left-hand blind crest. Challenging and tricky and another of the track's more dangerous sections. Returning to our bikes, we cycled down into the bottom of the gully and up another long tiring hill (again highlighting the track's verticality). Partway up, we stopped at another unmanned marshall station to marvel at the cars zooming by. 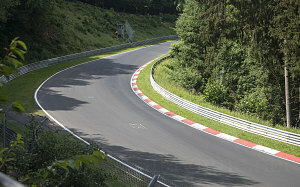 The downhill from the Aremburg turn to the Foxhole is long, and cars were whipping by here at frightening speeds. In the confines of the tall forest on either side of the track here, the high pitched screams of engines at redlines resonated and echoed everywhere. The land crested again around the Aremberg turn, and soon after that, we arrived at an old stone cross with faint engravings on it. 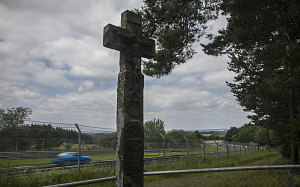 The track fencing was only a few metres from this monument. It marked the site of the murder of a tax collector by Swedish military defectors in 1638, and the spot is known as Schwedenkreuz, or Swedish Cross. 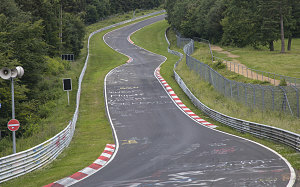 A nearby turn on the track is also called the same, and it is another high speed blind crest demanding of respect. After Schwedenkreuz we emerged into another nice bright sunny open field on the left, with the high speed downhill just beyond Flugplatz on our right. Flugplatz is the sight of a former airfield ("Flight Place"), but the old field is now mostly gone. 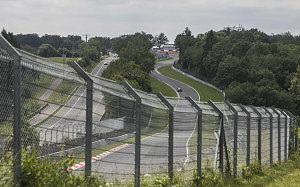 The beginning of the Flugplatz complex used to have a particularly sharp crest that caused most cars to leave the track and catch air (another type of "Flugplatz", you could say), but in more recent times some track work has shaved off some of the sharpness of that crest. One still gets light here, and in truly fast cars you will still leave the ground, but its tamer than it used to be. 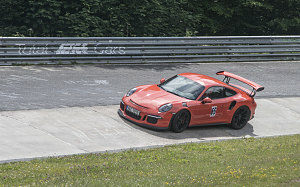 Not long after Flugplatz, we came to an open grassy hillock that offered a superb view of a whole series of esses at a spot called Hocheichen (High Oaks). It was about the right time (and this was a great place for track watching), so we stopped atop the hillock for lunch. 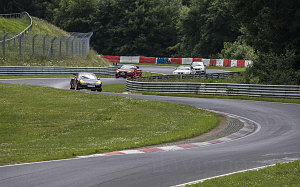 The spread of cars had become much more mixed, with all sorts of marques powering out of the esses and down towards the Quiddlebacher Hohe hump. Our tour of the circuit by mountain bike was turning out wonderfully. Not only were we seeing the track from many unique viewpoints, but the paths were remarkably free of other people or cyclists. Even here on this open hillock, there were only 3 or 4 other people about. Nice solitude. 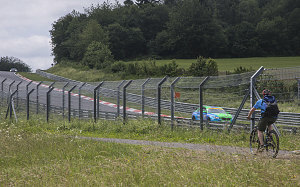 In our counterclockwise tour of the Nordschleife, we were now close to the regular start/finish line and its associated buildings and infrastructure, so we had to angle off and around. 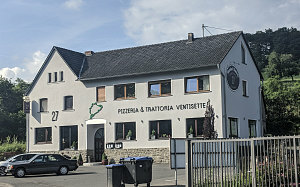 This brought us to the town of Nürburg itself, which is not far from this part of the track. 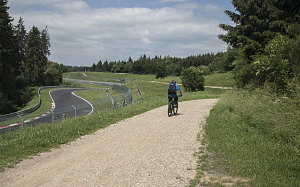 We chose a cycle route through the town, passing by various track-related businesses (a BMW M Motorsport center, the RSR-Nurburg car rental facility, etc). From the town it was an easy downhill glide to the Tourist-driving (Touristenfahrten) entrance, which we already knew from yesterday's exciting evening driving. 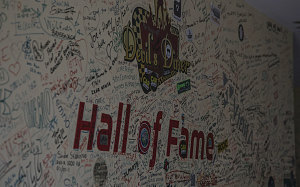 We stopped to visit the Devil's Diner cafe but were told we couldn't browser around on the paddock if we weren't guests of the private track event. So, on we cycled. 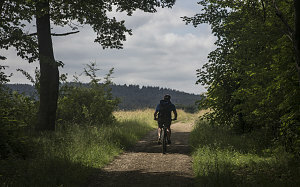 The next part of our mountain biking route was really just a ride down a highway - the highway running northeast out of town, exactly parallel to the long Döttinger Höhe straight. At the end of this long straight, we located a parking lot that contained a bike path trailhead, allowing us to continue along the inside of the circuit. 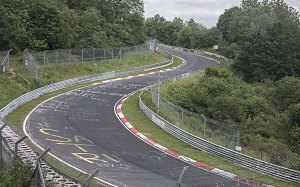 Not long after, we came to the Galgenkopf turn - the last turn before the long back straight and a somewhat tricky one at that - increasing radius rather easy to slide off if you don't get the right line when pushing hard. A bit of bush cycling with no views bypassed a significant chunk of track (we were slightly worried about getting finished and returning the bikes in time), then we crossed underneath (through a culvert) and came out along a nice section of path that directly parallelled the graceful -- and pucker-inducing -- rolling, hilly Stefan Bellof Esses section. They are named after a very talented German driver who set an unbelievable lap record of 6 minutes and 11 seconds in a Porsche 956 back in 1983. A Record that, as of the day we were standing in front of it - had not been broken - 35 full years. Somewhat interestingly, not two weeks after we were there, Porsche managed to break the record in a specially prepped 919 hypercar - in fact smashing the record, achieving a mind-boggling 5 minutes 19.546 seconds - nearly a full minute faster! That's an enormous reduction in lap time. 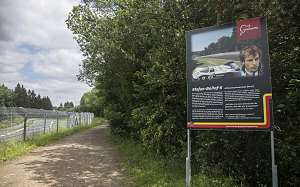 After the Bellof Esses came Pflanzgarten, with its tricky pavement dropoff right before a sharp turn, and then the media-popular Brunnchen turn (aka youtube corner). Many (most?) 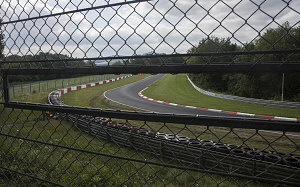 of the youtube videos of the Nordschleife are taken from this corner. 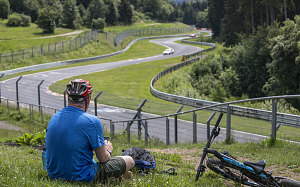 Sleep in - Coffee at the track cafe (at ex-Muhle) - Drone controller loss scare - found it - Mountain bike rental - Biking around the track - wow, hills are huge - Foxhole turn is scary fast by some guys. We were going a little bit faster now, not stopping as often and keeping an eye on the clock. 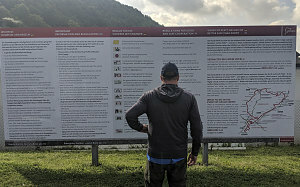 Not only did we have to get the bikes back before rental shop closure, but we didn't want to miss any of the evening's Touristenfahrten session. We were dying to get back on this fantastic circuit, and not just look at it from the saddle of our bicycles. 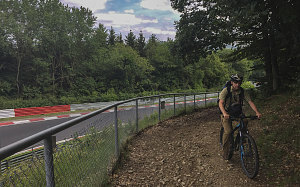 The final bit of climbing came as we crested near Hohe Acht, the highest part of the circuit (a full 1000 feet in elevation higher than the lowest point, if you can believe that!). 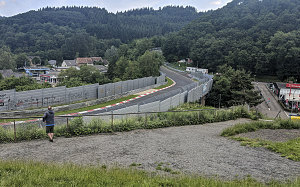 From there we cruised steeply down to the most famous curve of them all - the Karussell, with its weird and historic concrete banking. 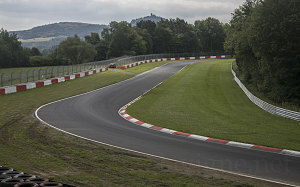 After taking in a few cars rounding the Karussell, we began the long glide down towards Adenau. 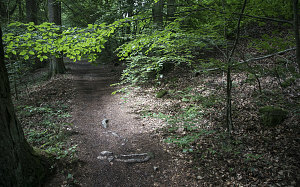 Since the Karussell/Hohe Acht part of the track is the highest point and the area at Adenau is the lowest part (and they aren't that far apart), it was a fast and quick glide down along a wide, gravelly path. Luke was impressed by how quickly we covered the last 25% of the circuit, but that was only down to the benefits of gravity than anything else. 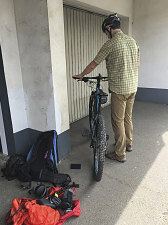 The beauty of our choice of itinerary was that we literally glided the last few kilometres straight into the parking lot of the bike rental place. Nice and tidy, and all of our sweat had dried off!